"The Gardens of Frank Lloyd Wright, " by Derek Fell, looks at four of the famed architect's major residential works in terms of how the architecture fits into the landscape. And how Wright utilized the skills of a landscape architect, as well as an architect, on those properties: his Oak Park, Illinois home/studio, Taliesin (Wisconsin summer home), Taliesin West (Arizona winter home) and Fallingwater (Pennsylvania commissioned residence). Fell is ideally suited to the task, being a garden designer as well as an award-winning garden writer and photographer. He knows when the hand of a great artist has been at work in a garden, having spent time in the gardens of Van Gogh, Cezanne and Monet, among others; later writing a book about each man and his garden. This overall view of the upper courtyard at Taliesin shows summer plantings. Wright's living quarters are in the background. You can also see the large pots and statuary Wright liked to use as garden focal points. "When I stepped into the garden at Taliesin and saw what Wright had done to create visual drama, I felt the same thrill as when I first stepped into Claude Monet's garden at Giverny, " emphasizes Fell in the introduction to this latest book. "It is the landscape of an original, implemented on a scale that is staggering in its sophistication." And staggering in its creation. Wright had no qualms about damming a stream to create a pair of lakes at his Wisconsin home, Taliesin; replacing an unwanted tree with a different variety or opting for raising Guernsey cows which he thought looked more attractive in the landscape than Holsteins — even though the latter produced better cream. Fell has produced a book that demands a place on the shelf of any student of Wright's architecture as well as students of native landscaping. Here are buildings that you thought you knew, all presented from a new and different perspective in hundreds of color photos that visually tell the story in every season aided by Fell's text. When you're talking about garden books, the number and size of the photos and the quality of the images is crucial. You need close-up detail shots of flowers and plants along with distance shots that situate the building and the plantings within the larger landscape. Fell provides all of this; but what's particularly noteworthy are the number of images that are full page and double page spreads. The size of all the pictures seem especially well-suited to the subject matter. The book contains 185 full color and archival photos, plans and planting schemes. Red dahlias, their color harmoninzing with the house behind, grow in the courtyard at Taliesin. Wright used this flower, among others, to fill the casket of his mistress, Mameh Borthwick Cheney, after her murder at Taliesin in 1914. Fell also considers the influence of Jens Jensen, famed Danish-American landscaper and fellow Wisconsin resident, on Wright. The two shared similar attitudes about preparing students for their respective professions: both believed in learning from, and living closely with, nature. At Taliesin, Wright made his students work in his orchards, grow their own food as well as flowers for cutting. At Taliesin West, he made similar demands but with a desert orientation. As a result, Fell says, Wright believed "they would develop a special respect for nature and not only take inspiration from it, but also seek to preserve it." Jensen and Wright were both inspired by the native prairies where they spent so much time: by the horizontal forms, the scale, the colors and textures. Ultimately both men turned to indigenous plants and trees to create informal, natural landscapes — Jensen in public parks and Wright at private residences, including his own. This meeting circle, situated in the desert landscape at Taliesin West, shows the influence of Wright's friend and fellow Wisconsinite, landscape designer Jens Jensen. 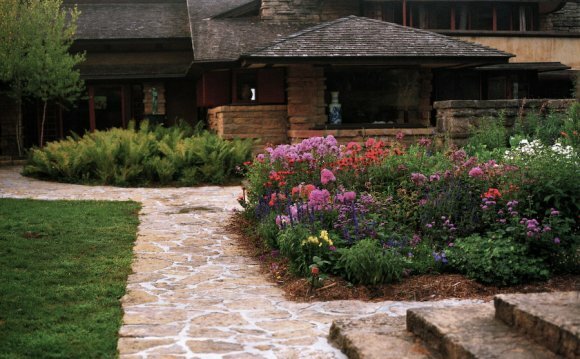 Fell briefly looks at some other Wright landscapes like the Walker House in Carmel, California and Monona Terrace Community and Convention Center in Madison. As someone who lived through the later stages of the debate and the construction of Monona Terrace, I can only emphasize Fell's statement that it was "one of Wright's most controversial designs." Though it may be hard for some readers to understand — or even believe — Wisconsin has often been unable to look beyond Wright's faults to his talents; the fate of many a native son. His spendthrift habits, loose morals and leaking roofs have been the main concerns of many in this community, concerns that resulted in Madison spending almost 60 years debating the merits of building Wright's Monona Terrace plan. Fell includes a dramatic picture of the building's William T. Evjue Rooftop Garden, named for its major supporter and donor who was also the founder and fighting editor of the state's most progressive newspaper, The Capital Times. When you stand at the railing at the edge of the Evjue garden, and look at the lake below, it feels like you're on a ship on the water. When you turn around and find yourself in perfect alignment with the Greek Revival Capitol building, the view takes your breath away. Despite its contentious history, a decade after its construction, Monona Terrace is widely popular, a local landmark and the rooftop garden is a favorite spot for wedding photos. This image gives you a sense of the dramatic scale of Fell's photos in his new book. It depicts the William T. Evjue Rooftop Garden at Wright's Monona Terrace Community and Convention Center in Madison. The first four (of nine) chapters in "The Gardens of Frank Lloyd Wright" are devoted to the four seminal Wright works. Though Fell emphasizes those, he looks broadly at his subject, touching on a variety of topics: Jens Jensen, Wright's garden sculpture, his prairie and desert style gardens and the specific plants they include. The book is unusual in that sense: not often do you find one title that contains ideas and information about two such different kinds of gardens and plants. Fell even includes "Ten Landscape Tips from Frank Lloyd Wright, " gleaned from his work and lectures, such as: "Take as much interest in the house surroundings as you do in the house interior. Plant for privacy and shelter as well as aesthetic appeal." That's not news to most gardeners but it may be for many architects and homeowners. There's also information on visiting all of Wright's designs that are open to the public as well as the expected bibliography and chronology. The chronology is particularly important because Fell includes only limited details about Wright — a man whose life was long, complex, and filled with drama. Fell includes it all, but the drama here is all outdoors: at Fallingwater where Wright exercised restraint, leaving the perfection of nature alone. And at Taliesin West where he exercised exuberance, turning the neglected native landscape into living, blooming sculpture. This elegant garden gate, designed by Wright, provides access to the staff gardens at Taliesin West. DISCLAIMER: Since I live in Wright's home state, not far from Taliesin, in a city with many private Wright homes that I've been fortunate to visit, I feel ideally placed to comment on a book such as Fell's. I've been to Taliesin, to Oak Park, and grew up in Buffalo, NY — another city with important Wright associations. Madison is also home to work by Jens Jensen, a close friend of Wright's.